A dealer who had a “very successful” £28,000 cannabis farm in his loft was spared jail . 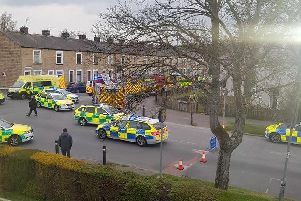 Burnley Crown Court was told how Aaron Carlos (24) was caught after police went to his home in Heath Street investigating a separate matter and were confronted with a “very strong” smell of cannabis. Police found 16 large plants nearing maturity in pots, as well as four harvested plants, heat lamps, fans, a water supply and power units. The plants could have produced 2.8 kilos of cannabis. Carlos claimed he was just growing and watering the drugs for someone else to clear a debt, but his mobile phone revealed supply-related messages, indicating he had been selling amounts of up to an ounce, for between £180 and £200 an ounce. Carlos admitted producing cannabis last June and received two years behind bars, suspended for two years, with 12 months’ supervision and a six months drugs programme. John Woodward (defending) said his life had changed dramatically since he met his partner, a mother-of-three. There had also been a building of bridges between the defendant and his parents, they were in court to support him and his mother would say he had changed beyond belief. Judge Lunt said she was gravely concerned the defendant still didn’t seem to have learned his lesson and was still using cannabis, even though his family and partner had come to support him.